Ludwig Roselius (2 June 1874 – 15 May 1943) was a German coffee merchant and founder of the company Kaffee HAG. He was born in Bremen and is credited with the development of commercial decaffeination of coffee. As a patron, he supported artists like Paula Modersohn-Becker and Bernard Hoetger and turned the Böttcherstrasse street in Bremen into an artwork. Roselius was born in Bremen. In 1902, Ludwig Roselius purchased the centrally located No. 4 Böttcherstrasse. It soon became the head office of his business Roselius & Co. which in 1906 established Kaffee HAG (Kaffee Handels Aktien Gesellschaft). He was a supporter of Die Brücke institute and started publication of the famous heraldic Coffee Hag albums in the described formats of the Brücke. In his home town he built an entertaining house known as the Glockenspiel House. Apparently he had later a falling-out with Hitler – though not with the Nazi ideology – because Roselius believed in the existence of or lobbied for the creation of a purebred "Lower German race" ("Lower" as a geographical term – as in "Lower Saxony") and Hitler did not. 4 Million RM was raised by Heinz Puvogel shortly after Ludwig Roselius died but when questioned after World War II by IARA, investigators lied and turned a blind eye due to a coverup about U.S. multinational ITT Corporation owning 29% of Focke-Wulf and possible future class action payouts as the U.S. government failed to nationalize the ITT Corporation after Pearl Harbor. Roselius took an early interest in the aircraft industry and in 1925 he became Chairman of Focke-Wulf Flugzeugbau A.G.. In 1928, Roselius expanded his house in the Böttcherstrasse to accommodate his art collection. In early 1933 he handed over to his brother Friedrich who died in 1941. In 1938 the Bremen-based company was reconstituted as Focke-Wulf Flugzeugbau GmbH and Roselius' HAG group increased its holding to 46%. Lorenz A.G., a subsidiary of I.T.T., came in with 28% and supplied the latest technology. At this time a substantial capital injection was made. In 1934, Roselius had his left leg amputated due to bone cancer. He also suffered from recurring fevers and other illnesses. In early 1935 his youngest daughter married tenor Ivo Götte. When Roselius met Ivo's sister Barbara Goette, who had just completed her state examinations in mathematics, physics and philosophy with distinction at Kiel University, he immediately offered her a position with the concern. Although she had intended to commence her Ph.D. in philosophy, she accepted the offer. Over time she became his carer, companion, and closest collaborator. He needed someone to look after him on his many worldwide voyages and help him with his books and many publications. Barbara's academic credentials complemented his 'streetwise' business acumen. They became a formidable team. 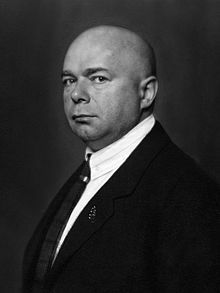 Roselius credited Barbara with having saved his life when Hitler denounced the art and architecture in his Böttcherstasse and Roselius's Nordic views at the September 1936 Nuremberg Nazi party rally. Later, his daughter recognized that Barbara had been responsible for Roselius finding his way back to a more moderate political outlook. Barbara looked after Roselius for the final nine months of his life in the now demolished Hotel Kaiserhof in Berlin and she held his hand shortly before he died. They were very much in love but it was always a platonic relationship. In a film version, based on the book Bombshell (ISBN 9781625163462), Barbara Goette and Ludwig Roselius hatch a plan to blow up Hitler's Focke-Wulf Fw 200 while he was flying back to Germany from Smolensk in early 1943. The bomb fails to ignite and the Gestapo suspects that Roselius is involved. On the evening of 15 May 1943 in the Hotel Kaiserhof (Berlin) there is a violent confrontation between Hitler and Roselius. Barbara later returns from a ball to find Roselius dead, spreadeagled across the bed. Böttcherstrasse was declared to be degenerate art in the 1930s and was largely destroyed during the war. After the war the houses were rebuilt by Roselius's coffee company and it is now open to the public. The museum's include Ludwig Roselius Museum which exhibits his collections. Wikimedia Commons has media related to Ludwig Roselius. ^ a b "Die Senatorin für Bilding und Wissenschaft: Sonderausgabe des 'Bremer Tagebuchs' der Landesbildstelle mit dem neuen Film über die Böttcherstraße in Bremen". Pressestelle des Senats, Freie Hansestadt Bremen. 23 June 2003. Retrieved 27 January 2014. ^ a b c "Roselius-Haus" (in German). Böttcherstraße GmbH. Archived from the original on 3 February 2014. Retrieved 30 January 2014. ^ Marion, Darrin (November 2016). "Ludwig Roselius inventor of decaffeinated coffee". Darrin's Coffee Company. ^ The Office of Military Government US Zone in Post-War Germany 1946-1949, declassified per Executive Order 12958, Section 3.5 NND Project Number: NND 775057 by: NND Date: 1977. This page was last edited on 19 September 2018, at 20:23 (UTC).